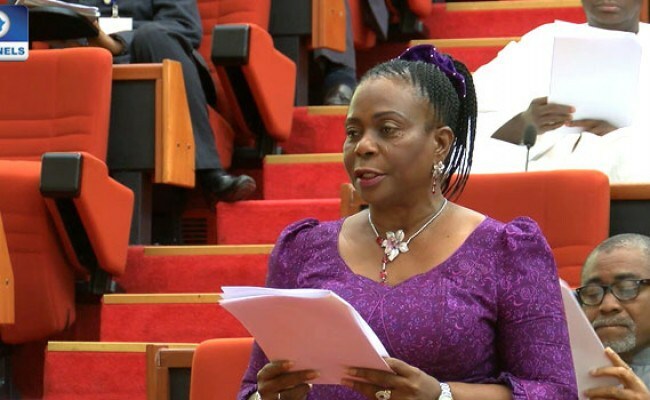 Female Senator Slapped By National Assembly Staff In Abuja? It was pure drama that was recorded on Monday at the new wing of the Senate complex in Abuja after a National Assembly official physically assaulted the senate deputy minority whip, Abiodun Olujimi. The incident happened shortly before the commencement of a public hearing of the committee on petroleum (downstream). Trouble started when an official of the Parliamentary Staff Association of Nigeria (PASAN) rode in the same elevator with the lawmaker, Premium Times reports. Lifts in the assembly are installed in pairs, one reserved for lawmakers (Senators and House of Representatives members), and another for other users. The senator was on her way to the petroleum committee public hearing while the PASAN member, who was not immediately identified, was to attend a meeting of his association. The PASAN meeting was in preparation for a strike which the association is about to commence. A witness said when the lawmaker saw the PASAN staff in the elevator reserved for lawmakers, she demanded to know why he used the same lift with her. The witness said the lawmaker directed her aide to “slap” the legislative official, who immediately responded in kind. The PASAN staff however slapped the senator and not her aide. Neither the senator, her aide nor the PASAN staff gave further details of the incident as journalists inquired. Mrs. Olujimi left the elevator and challenged the PASAN official, who was immediately shielded by his colleagues. The PASAN staff refused to apologise, and it took the intervention of National Assembly security officials to rescue her from the scene. Other PASAN members declined comments and refused to give the name of the official involved. The senator thereafter attended public hearing. In a chat with some journalists after the hearing, she vowed to take up the case with the National Assembly security.